The SAN Nutrition Gym Bag makes the perfect companion for all your exercise and workout sessions as it easily stores all your gym accessories, supplements and clothing. This gym bag is made using highly durable materials that will keep up with your active and on-the-go lifestyle. 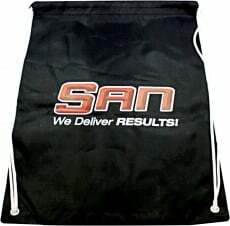 The SAN Nutrition Gym Bag features the distinctive SAN Nutrition logo in front, letting everyone know the kind of quality you choose when it comes to your workout supplements. This gym bag easily fits your supplement containers, extra shirts and gym wear, shoes, and towels. Reliable, tough, and classic... that's the SAN Nutrition Gym Bag! Have a question about Backpack? What is it, what does it do, how and when to use or something else? Ask us.